Speaking of banjos, ukelele and Vaudeville — You were just speaking of that, right? — I just got this email from Plucky Rosenthal, whom you'll remember from my post last September. She's putting on a show in Wilmette, Illinois, that sounds wonderful. I am so excited to announce an amazing show that I co-produced and am headlining THIS April Fool's Day at the movie theatre in Wilmette! What better way to spend a Thursday? It starts at 7:30 and I'll have you home in time for Leno. As some of you know, I've been working hard on my vaudeville-style comedy act for a year now, and this is my producing and headlining debut. For one night only, you can see more than just my usual five minute shtick - you get a whole show! Of me! Can you stand it?? 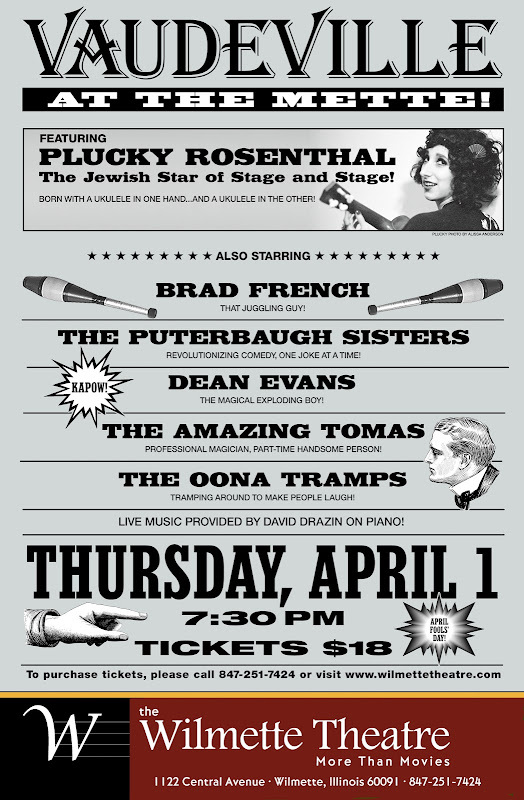 With some of my very favorite Chicago vaudevillians opening for me and in the setting of a beautiful old movie theatre, this is not a show to be missed. But not to fear! if you must miss it, I have many other chances coming up for you to see me rock a ukulele and banjo 1920's-style. This is the only mass e-mail I'll ever send out, so please let me know if I got your e-mail address by mistake. Otherwise, make sure to check me out on Facebook and MySpace to keep up with further performance dates - and soon will be the launch of my website where I officially become a dot com! Lookit all those numbers in that hyperlink. How can you say no to that? Hope to see "uke" there!